Make your guitar sound unique! 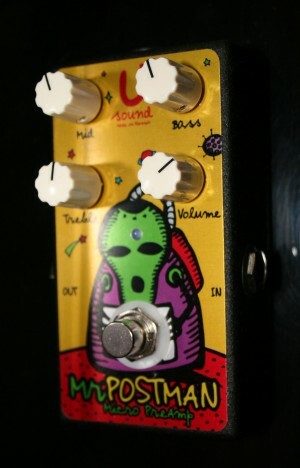 This stompbox is used as a tone booster with the other guitar effects, or as a complete preamp. The basis of this device is a circuit of "Simon Boost" with some modifications such as low-noise chip Burr Brown, added three sectional Dip Switch, the newest PCB and more. By removing the bottom cover of the device you'll find a three sections Dip Switch as addition to standard adjustments (Volume, Bass, Mid, Treble). "Mr. Postman" makes vivid and expressive sound of any guitar or bass. You can put it at the beginning and at the end of your pedal board. At the beginning of the board it is functioning as a boost, at the end of the board - as a preamp and equalizer. This stompbox is handcrafted from selected components, it has minimal internal noise and will satisfy the coolest musicians.